Even before we bought an RV and adopted the vagabond lifestyle, we started a Blog. I’ve always been a journal writer, this is just the easiest way to keep a journal in today’s digital world. I would keep this blog even if no one else ever read it. It is my journal. I love going back to previous entries and remembering some part of our journey. In the beginning I even set the security so that no one could see the blog except me and a couple other family and friends. Now I have it set to public so anyone can see it. We’ve made new friends along our way because it is so easy for them to get to know us, and keep track of us with the blog, One of the features of a blog is the ability for a reader to leave a comment, making it a two way communication. And, if I ever did want a book, that is easily accomplished with web services like Blog2Print.com. In each blog post I write some narrative about where we are and what we’re doing. I also include pictures, maps, and links to other websites such as the RV park where we’re staying. This becomes an invaluable resource for us when we find ourselves returning to some area where we’ve been before. Blogging is very popular among RVers. You can see a list of hundreds of RVing blogs at HitchItch.com. But what if you don’t like to write? You just want a photo album. Well, we keep a photo album also. We’ve been using Picasa Web Albums since we started RVing in 2004. It is now transitioning into Google+ Photos, but all of my albums are still there. Edit your Pictures First. The main reason we use Picasa Web Albums is because we use the Picasa desktop software to manage all the pictures on our computer. For example, so far this month (May, 2013), as we’ve traveled from Florida to Colorado, we’ve accumulated 629 pictures in this month’s folder on my computer. I use Picasa to work with them there. I spend a few minutes every day going thru my pictures with Picasa and making them look better with a little bit of cropping and some color correction, maybe a frame, and definitely a caption. Upload your Best. The pictures I like the most, I upload to Google+ Photos (what used to be Picasa Web Albums.) Picasa makes this drop-dead simple. just click on the pictures you want to upload and then click the button “Share on Google+.” Of the 629 pictures in the May folder on my computer, I’ve uploaded 181 of them. Then, I use the pictures on Google+ Photos to include in my blog posts. I don’t have to upload them separately to the blog, I just use the “Insert Photo from the Web” command. I count roughly 79 pictures used in the blog during May so far. The web space for your pictures is provided for free by Google. So, if you had no interest in reading or writing blog posts, you can just skip the blogging part altogether and just use the Web Album. You can see our May 2013 web album, click on the first picture to see it full screen, and even click “Slideshow” to watch all 181 of them play automatically. You should notice the captions to the right of every picture, and even a space where you can leave a comment as well. 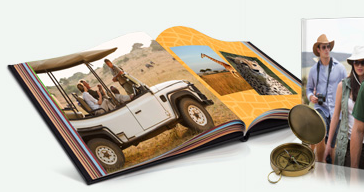 Print a Photo Book: There are lots of services which will take your digital photo albums and turn them into 4-color books. In fact, using Picasa on your computer, there is a command on the File menu called Order Prints that will take all the pictures you’ve selected and send them to a service that will print your book. All you have to do is pay for it! Pictures and Blogs are two of the main topics we (Geeks On Tour) teach. We make tutorial videos in 5 minute segments and have produced several hours worth of training on how to make a Blog using Blogger.com, and how to manage your pictures using Picasa. You can go to our Learning Library right now. Just pick your topic and learning by watching videos. After the first 3, you will need a username and password. Published by MrsGeek, in Blog. Tagged with Free Online photo albums, Free Online travel journals, Use Blogger for your online journal, Use Picasa for all your digital photos.